Have you ever thought about trying music therapy? Music therapy can take many shapes. It can involve listening to music, creating, singing, and playing music, or moving and dancing to it. It involves using music in a therapeutic relationship to address physical, cognitive, emotional, or social needs. ●	Motivating movement, which can help release mental and physical stress. Even for seniors who don’t have the mobility to dance, something as simple as tapping your foot can help lower blood pressure. ●	Relieving boredom, loneliness, and social disconnection, which can all be symptoms of losing mobility and becoming less physically active with age. ●	Recalling positive memories that are closely associated with music. A music therapist may choose music from a particular time or that has an important emotional meaning for the patient. This is one of the reasons music therapy is so commonly used in dementia treatment. ●	Calming nervousness and anxiety. Whether it’s anxiety as a result of dementia or loneliness, music therapy can have a calming effect. Slow and peaceful music might be used to relieve stress and mental tension. ●	Promote socialization. Sometimes music therapy can happen in group sessions. The social aspect of music therapy is a mood booster itself. If you’ve never tried music therapy, you might have a lot of questions about what it is and who it’s for. Music therapy is commonly used in seniors with dementia, but they are by no means the only people who can benefit from it. Music therapy can work for anyone. It can be used as part of Alzheimer’s and dementia treatment, for improving mental health, for medical patients, or just about anyone. Music therapy is provided by a professional music therapist. 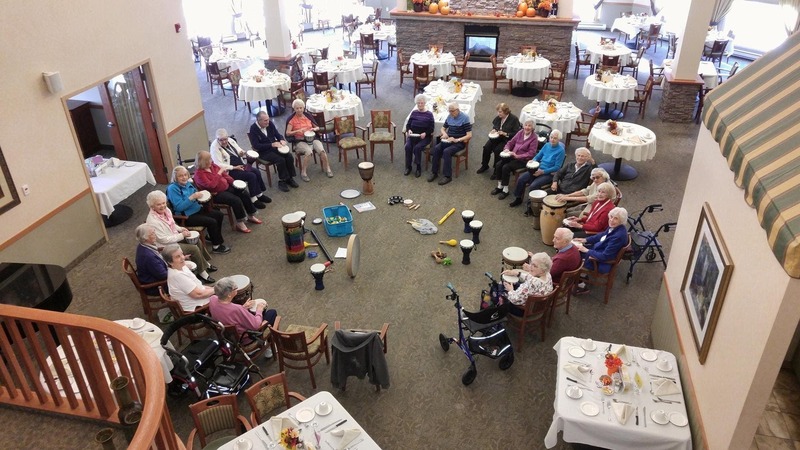 Retirement communities such as All Seniors Care Living Centres may offer their residents music therapy sessions. Music therapy is provided much the same way occupational, physical, or psychological therapy might be. As a proven, evidence-based therapy, music therapy can be used for many different people and purposes to achieve individualized goals. To learn more about the availability of music therapy in retirement communities, drop by your local All Seniors Care Living Centre with any questions you may have. The effectiveness of music therapy is backed up by therapeutic research. Music therapists use music as a tool to facilitate non-musical changes: changes in mood, memory, and positive thinking. Music therapy can improve your mood, motivate you, calm nervousness, and encourage happy or positive thoughts. From Alzheimer’s treatment to everyday mood improvements, music therapy can do a lot to improve your mood. If you’re looking at moving into a retirement residence, either yourself or on behalf of a loved one, consider the importance of having music therapy readily available.